A volume pedal is a rather self-explanatory type of guitar gear – it's a pedal that adjusts the volume of your guitar. Additionally, it's a tool that can be used to adjust the level of other effects (level of distortion, level of reverb, level of just about any other pedal), at which point it gets branded as an expression pedal. Simple enough, right. 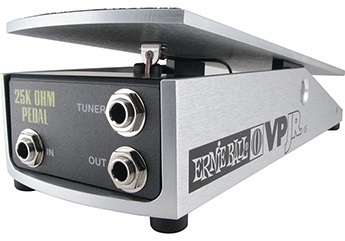 One of the most renowned makers of volume pedal is Ernie Ball, a company that's been around for quite some time, and a manufacturer behind some of the most iconic guitar strings of all time. Their volume pedals are known for being sturdy, versatile, and able to adapt to a variety of instruments and gear. We took the liberty of diving deep into the EB realm to bring these puppies a bit closer to you. We're looking at a total of seven models, do check them out! Kicking things off in style, we bring you the MVP! 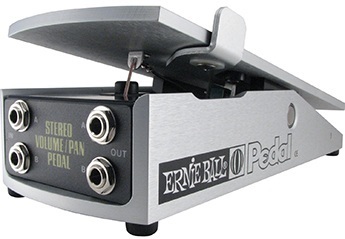 Hailed as the world's first ever volume + overdrive pedal, this Ernie Ball pedal delivers quality dual tone control. It operates with equal efficiency on any position in the signal chain, allowing you to give yourself a strong volume or gain boost at any point during the performance. The pedal is also quite strong and sturdy, rounding up a top-level bang for the buck. If you're looking for a high-quality volume pedal that can fit just about any pedal-board, Ernie Ball 6181 is your winning ticket. This fella offers all the capabilities, durability and tonal control of a high-end Ernie Ball volume pedal, but summed up in a smaller package. Apart from standard In and Out plugs, this fella also features a Tuner out. 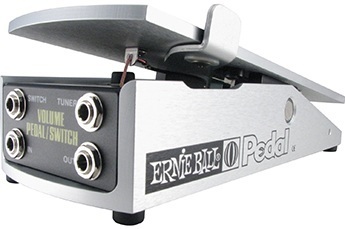 The price is affordable and fits the classic Ernie Ball volume pedal budget. 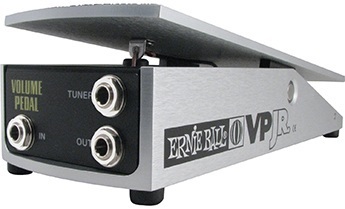 The third option goes by the name of Ernie Ball VP Jr P06180. Still keeping the Jr. size of the previous model, this pedal has been optimized for passive electronics. The item utilizes a mono volume control, along with a taper switch for two different swell rates. Apart from that, the remaining features and design are very similar to the 6181 model. 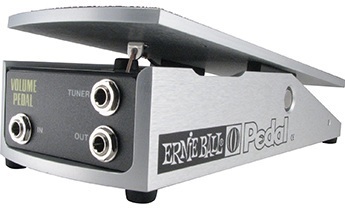 For advanced users, we bring you the Ernie Ball stereo volume pedal, the 500k mark. Stereo pedals are ideal for musicians that utilize multiple amps during performance featuring two In and two Out plugs. The pedal separates the signal into two different audio outputs, allowing you extra tonal control. This specific model has been optimized both for active and passive audio signal, featuring the ability to control both volume and panning. 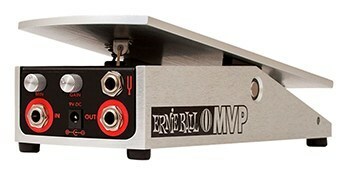 Another option would be the Ernie Ball 25K stereo volume pedal. This device is very similar to the previous 250k model, except that it is focuses on active signal only. We are looking at that same casing, elegant and solid as a rock. 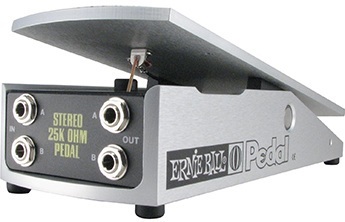 The pedal can control only volume, featuring a set of stereo outputs and inputs. If you know that active signal is your thing, and that it won't change in some time, this pedal is what you need. Utilizing a 250k ohm resistance, the Ernie Ball 6166 pedal is perfectly suited for users of passive electronics. We are still looking at that chunky and sturdy casing, except that this time around the pedal has a taper switch behind the jack area right beneath the footplate is. This secures two distinct rates of volume swell. And finally, a slight variation of the 250k – the switch model. Everything about this fella is essentially identical to the previous product on the list, except that an on/off switch has been added for extra convenience. We're still looking at the 3.9 lbs weight and a total size of 11.5 x 5.5 x 4.5 inches. When all is said and combined, these products easily rank among the best volume pedals on today's market. Now it's just a matter of jotting down your exact needs, personal preferences and available budget in order to single out the best model for you. Once that is out of the way, feel free to treat yourself with one of these bad boys as early as today. A thumbs up from here!